Shimla, Jan 31 : Nearby spots of the Himachal Pradesh capital and Manali received an overnight spell of snow on Thursday, bringing cheer to tourists. Some towns in upper Shimla district were cut off after snow piled on roads, officials said. The "Queen of Hills", as Shimla was fondly called by the erstwhile British rulers, got mild rains. There were chances of snow later in the day, the Met said. It saw a low of 3.8 degrees Celsius. 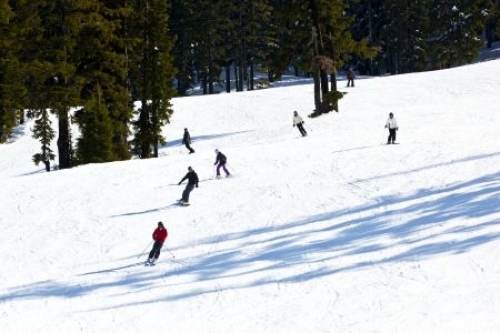 As news of the snowfall spread, tourists started reaching Shimla's nearby places like Kufri, Mashobra and Narkanda. "This weekend we are expecting a good rush of tourists in Shimla and its nearby picnic spots," D.P. Bhatia, liaison officer with Shimla-based Oberoi Group of hotels, told IANS. Hills overlooking Manali like Gulaba, Solang and Kothi have been experiencing moderate snow since Wednesday, according to a meteorological official here. Manali, which saw a low of zero degree, experienced three centimetre of snow. "The higher reaches of Lahaul-Spiti, Kinnaur, Kullu, Shimla, Mandi, Sirmaur and Chamba districts have been experiencing snowfall, while mid and lower hills are experiencing rain," the official said. Kalpa in Kinnaur district and Keylong in Lahaul and Spiti have also experienced snowfall. They saw a low of minus 6.8 degrees and minus 15 degrees Celsius, respectively. Dharamsala in Kangra district, which experienced 8.2 mm rain, recorded a low of 3.4 degrees Celsius. Traffic movement beyond Dhalli, 10 km from Shimla, was suspended partially as a large stretch of the Hindustan-Tibet Road was under a thick blanket of snow. The Met Office said a western disturbance -- a storm system originating from the Mediterranean-Caspian Sea region and moving across the Afghanistan-Pakistan region -- would remain active till Friday, bringing more rain and snow.